Added. Just start typing "Nibelung" and your name should appear. Just start searching for "sheepslay3r" and the dropdown should show your name. Hi poi, could you please add my scaled G25 coordinates to this tool? Thanks! Some fits for some Saidu sharif samples. The fit gets worse when BMaC or tepe Hissar is used instead of western Iran ChL such as Seh Gabi. Doesn’t make sense archeologically, unless if these steppe groups hopped into Iran first then into South Asia? I dunno. there seems to be a bug. When you repeat the run with one fixed sample, the percentages change each run in that same sample. That is most likely the error margin, it is bound to fluctuate within the margin as it iterates, since its a statistical model, it approximates. Last edited by surbakhunWeesste; 07-22-2018 at 09:10 PM. How does that comport with what the Reich group posited? "there is no evidence that the main BMAC population contributed genetically to later South Asians. Instead, Steppe communities integrated farther south throughout the 2nd millennium BCE, and we show that they mixed with a more southern population ... We reject BMAC as a primary source of ancestry in South Asians." Do they mean SwatValley IronAge samples as "later South Asians"? I thought so too when the study came out and I read the that bit. 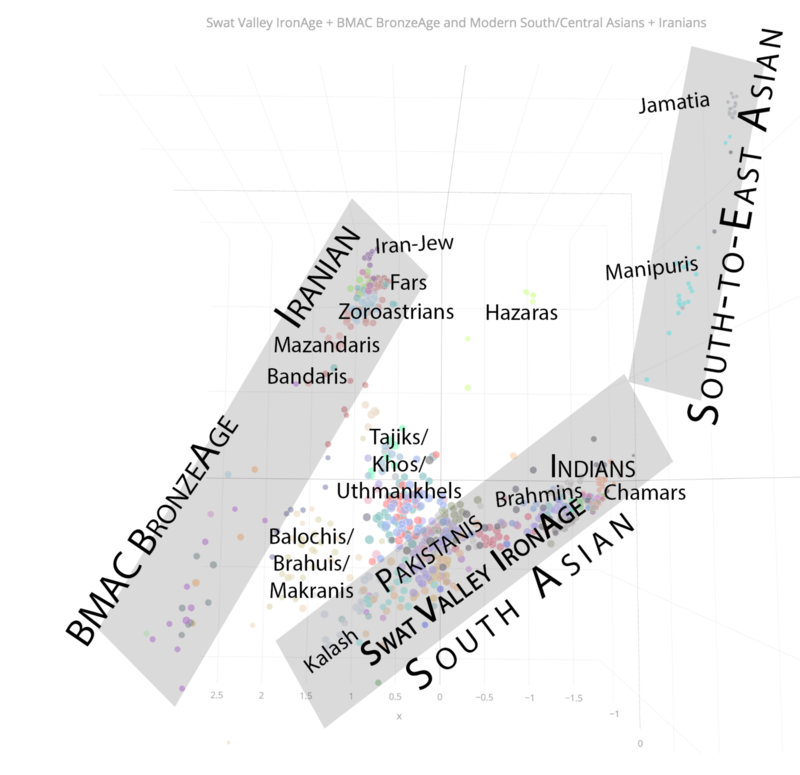 The PCA using 12 "best" nMonte models (out of 5400 that I ran) for BMAC+SwatValley+IVCp+SouthAsians+Iranians kinda shows DISTINCT BMAC as well. Last edited by poi; 07-23-2018 at 01:17 AM. Yes that is my understanding - Swat IA = later South Asians. "while the BMAC was affected by the same demographic forces that later impacted South Asia (the southward movement of Middle to Late Bronze Age Steppe pastoralists described in the next section), it was also bypassed by members of these groups who hardly mixed with BMAC people and instead mixed with peoples further south [Indus Periphery]. In fact, the data suggest that instead of the main BMAC population having a demographic impact on South Asia, there was a larger effect of gene flow in the reverse direction, as the main BMAC genetic cluster is slightly different from the preceding Turan populations in harboring ~5% of their ancestry from the AASI." Last edited by parasar; 07-23-2018 at 02:13 AM. There is one Gonur2 bmac sample which clearly clusters with the SouthAsians. And both Dzharkutan2 samples cluster with the Iranians. So even in nmonte based data, we can see geneflow from South Asia and Iran into bmac. yeah. I have seen 5-10% coming through Gonur2 but can go to as high as 20+ % in some configurations. It might be related to Tepe Hissar.